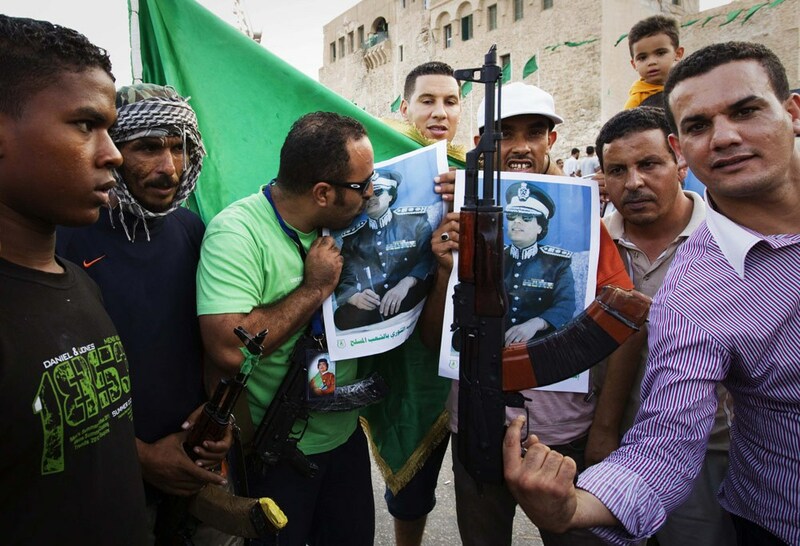 Gun Laws and the Right to Bear Arms in Gaddafi’s Libya – Ila el amam! December 29, 2012 – The scene starts to become familiar: An adolescent male diagnosed with a mental disorder who is on prescription medication and who often is described as a lone nutter, goes to a school or another gathering place of youngsters and kills a significant number of them before eventually killing himself. After that, the entire nation and pretty much the entire Western world reacts with a flood of strong emotions and a sense of growing insecurity regarding the safety of not only themselves, but also of their precious children. A seemingly emotional speech by the country’s president and a touching X Factor tribute to the victims of the recent Sandy Hook Elementary School shootings only fuel the perception of the ubiquitous presence of psychopathic individuals who are about to mass wound and mass kill in formerly safe environments. As a result of the emotional trauma that is inflicted upon those who witnessed, heard or read about the horrific killing of children, the call for gun laws in the United States has become louder and louder last weeks and the debate on the topic has become more intense than ever. Some say that if schools would have access to weapons they would become a safer place for that reason, while others say that the free ability of weapons is the problem. The bigger question however is: what is the real reason the American government wants gun laws for? Did Obama’s fabricated tears show his empathy for the suffering of the victims of “Sandy Hook” and their survivors, or did the very suffering actually provide a basis for the execution of the government’s plans? Could those plans even be executed without the existence of the problem of deathly violence at schools, universities et cetera? And the key question always is: who actually benefits from the situation – a situation in which parents out of fear massively will agree to even more surveillance cameras and security personnel at schools, and schools thus will be turned into modern day prisons? Most of the world’s media, which has rightly commemorated the children of Newtown, either ignores Obama’s murders or accepts the official version that all those killed are ‘militants’. The children of north-west Pakistan, it seems, are not like our children. They have no names, no pictures, no memorials of candles and flowers and teddy bears. They belong to the other: to the non-human world of bugs and grass and tissue. ‘Are we,’ Obama asked on Sunday, ‘prepared to say that such violence visited on our children year after year after year is somehow the price of our freedom?’ It’s a valid question. He should apply it to the violence he is visiting on the children of Pakistan. It has become more than apparent that the bomber of African, Middle Eastern and other countries couldn’t care less about children and their fate. In fact, the game behind introducing gun laws is exactly the same as the game behind the NATO-overthrow of the Libyan Jamahiriya in 2011, namely to take control of a country in a way that its power no longer will belong to its people. In the very same way the Nazi’s introduced gun laws saying Jewish people could not own ammunition on the eve of World War II and we all know the results of that. The Third Universal Theory heralds emancipation from the fetters of injustice, despotism, exploitation, and economic and political hegemony, for the purpose of establishing a society of all the people where all are free and share equally in authority, wealth and arms. Freedom will then triumph definitively and universally. The political and economic problems of minorities can only be solved within a society controlled by the masses in whose hands power, wealth and arms should be placed. To view the minority as a political and economic substrata is dictatorial and unjust. Democratically, no individual or team has the right to monopolize sport, power, wealth or arms for themselves. Why was it that the people of Libya endured the invasion of the most powerful military alliance in the history of time for over eight months? Simply because there was an armed population fighting NATO and the tens of thousands of rebel ground troops that were funded and supported by NATO. It is no coincidence that Libya among other countries with a similar concept of “guns to the people”, such as former Yugoslavia, had to be invaded and destroyed prior to the eventual introduction of gun laws in the invaders’ country itself. In the case of Libya, the problem of “a cruel dictator who was about to kill his own people” was created in order to make ignorant, frightened and docile souls turn to NATO for their perception of safety. Subsequently, in case of the United States, the problem of “omnipresent child killers” was created (and likely will be further built out in the near future with similar horrendous events up to come) in order to make ignorant, frightened and docile souls driven by the same perception turn to their government for protection. Is Libya free at this very moment? Will the American people feel safe and protected when being micro-chipped and surrounded by surveillance cameras and armed uniformed people wherever they go? Contrary; both are and will be suppressed by the globalist powers that ultimately care about only one thing: total control of the world through total control of your mind. With another year of (information) war, violence and death nearing its end, let us no longer turn to our supposed leaders, politicians, army forces, police officers or any “representative” who we consider to be our safety or hope. Let us instead stop passing on our responsibility to someone or something else, even though the entire world seems to encourage us to do so. You will soon be labeled a terrorist when you refuse to hand over your ammunition and power to government figures and for much less reasons than that. However, when you and I will take responsibility for our own actions and thoughts, the credibility of the control system will fall before our very eyes, and a true Jamahiri society will arise from its ashes – it is as simple as that.